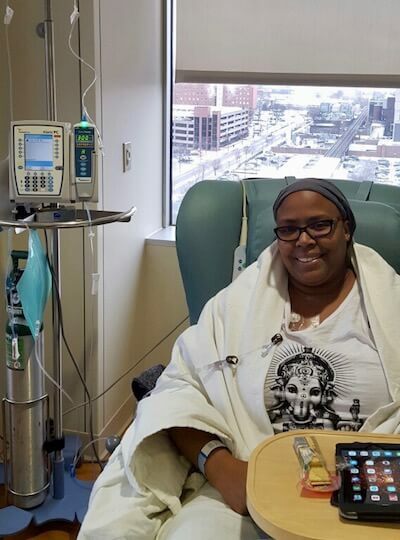 Cancer gave Bisa Myles a completely new perspective. 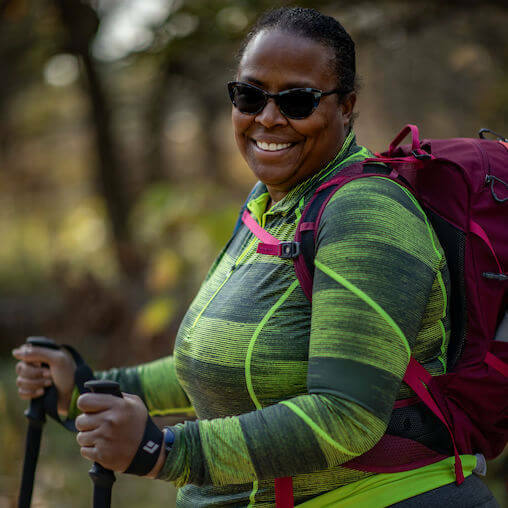 Now, she’s prioritizing travel adventures and taking on the tallest mountain in Africa with the Curvy Kili Crew. 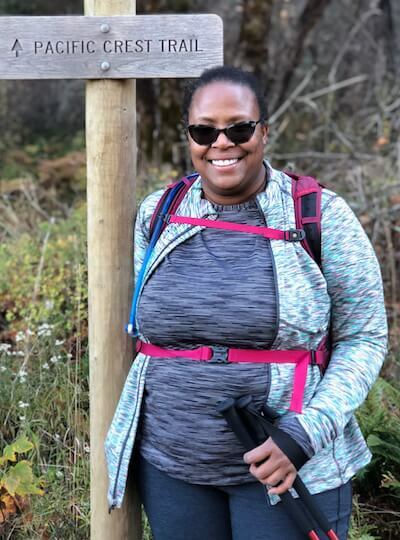 Written by Bisa Myles, a member of the Curvy Kili Crew. I had done some traveling before I was diagnosed with cancer. I often dreamed of quitting my job and becoming a travel writer and photographer. But I had three teenage girls to raise and those dreams were put on hold. After I survived cancer, I felt like I was given a second chance to fulfill that dream. That’s how my blog Myles To Travel was born. When I finished treatment in June 2016, the doctors gave me a five-year survivorship plan. The chances of a reoccurrence are highest in the first five years after treatment is over. The plan lists how many exams, scans, and labs I would need to have over the next five years. This didn’t feel like a survivorship plan. I felt like I was sitting and waiting for the cancer to come back. So I decided to create my own five-year plan and I called it, Chasing 50 in Five Years. My list included 50 countries and experiences that I wanted to have in five years. Mt. Kilimanjaro was not on the original list. I admit the list was a little ambitious, but it wasn’t about checking everything off if it—I needed something else to focus on besides breast cancer. Around the time I heard about the hike to Mt. Kilimanjaro in the fall of 2017, my oncologist had reduced my office visits from every three months to every six months. This was a huge milestone for me. Less frequent visits meant they were less concerned that the cancer was going to come back. Still, signing up for a trip over a year and a half away in March 2019 seemed foolish. I had already had two scares of a reoccurrence that luckily turned out to be benign. It was hard for me to plan for something that far in advance. At the start of 2018, I checked the signup list daily to see how many spots remained open. By early March 2018, there were only three spots left. I just knew it was going to fill up and I would be waitlisted. 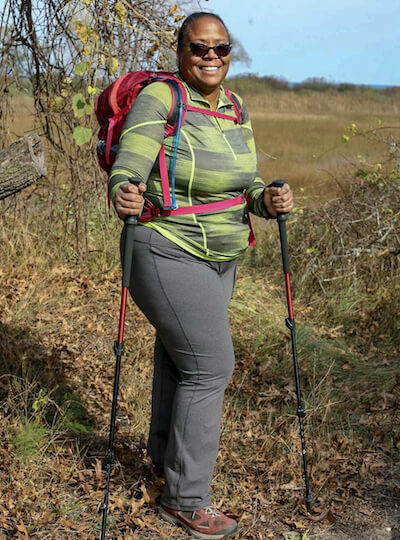 My next mammogram was scheduled for March 21, 2018, and I had told myself that if I received a clear, that I was going to put the deposit down to hike Mt. Kilimanjaro with the Curvy Kili Crew. The results were good, and I officially joined the group three days later. Soon after I signed up, it was posted in the group that we all needed a signed medical release form. I didn’t think of that before. Of course, it’s a liability issue to lead people up a mountain, and you want to make sure they are physically capable. I started worrying and thinking there is no way a doctor was going to sign it. I told Christa in a private message my concerns, and she sent me a video about a group who had stage four cancer and hiked Mt. Kilimanjaro. This inspired me to continue, get my doctor’s sign-off, and stay in the group. I started training in April 2018. I had never hiked before, so I just starting walking around the neighborhood park. Day by day, I felt stronger physically and mentally. 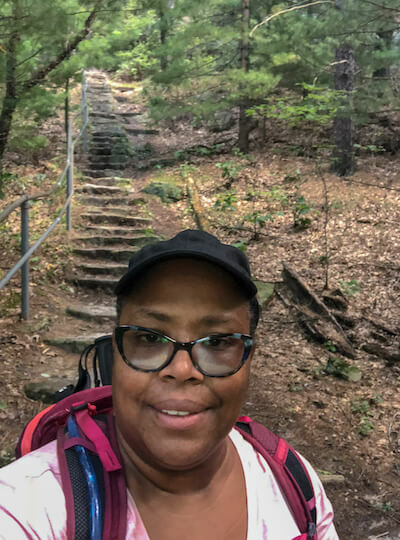 In June, I started hiking on trails weekly. The more I went hiking, the more I believed I could do anything. Thoughts of when the cancer was going to come back didn’t consume me as much as they did before. 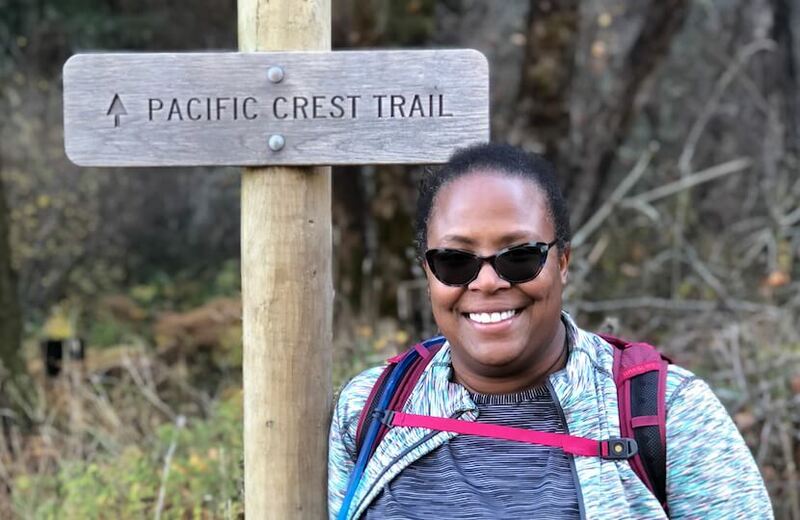 Traveling, in general, was part of my recovery, but hiking was something I could do more often, and it helped ease my anxieties. Training was going well, I was ticking things off my gear list, and the due date for the medical forms was approaching. I planned to see my primary physician to fill out the forms after my next six-month mammogram in September 2018. I was excited for this appointment because at the last one, the radiologist said after this scan, I could go back to getting annual mammograms. When I walked into the room to get the results of the test, I could see the images on the monitor were not clear. There were little white spots that were not there before. It showed calcifications in my breast surgery scar. The doctor told me that it is not uncommon to see this in the scans after surgeries. Anything less than a 100% clear was not comforting to me. She said I needed to come back in six months. This is not what I was expecting to hear. I usually see my oncologist on the same day as I have my mammogram, but because of scheduling, I had to get the scan earlier. This was a mistake because now I had to wait five days to talk to my oncologist. In the times of the internet, I couldn’t help but search what breast calcifications are. According to WebMD, breast calcifications may suggest early breast cancer. After reading that, I couldn’t wait, so I sent my doctor a message to review the results before my visit. The nurse called me back and repeated what the radiologist said—that this was due to the scar. This didn’t make me feel better. My appointment was now two days away, so I could speak directly to my oncologist. The day of my appointment had arrived, and I sat anxiously waiting on the table in my hospital gown, preparing myself for bad news. After we exchanged pleasantries, she said what I needed to her to say, “You don’t have cancer.” I didn’t tell her what my research said or bombard her with questions. I accepted that right now at this moment, I don’t have cancer. Without knowing it, the women in the group helped me keep going. Just by sharing their journey in our Facebook group, it helped keep me focused on the trip. I kept training and meeting new people online and enjoying the outdoors. I’m not going to lie and say I don’t worry that my next scan will show that the calcifications have developed into cancer. Sometimes I fear that the hike on Kilimanjaro could be my last trip. I try to focus on what I do know. I know I have to live in the present and I can’t let the fact that I had breast cancer deter me from living my life. I’ve read numerous blog posts and watched videos and everyone who has climbed Mt. Kilimanjaro said that it was the hardest thing they’ve ever done. I start to think about the hardest thing I’ve ever done, and that was going through cancer treatment. I can’t imagine anything harder than that. I will let you know which one was harder when it’s over. Photo below courtesy of Bloom Photography LLC. Follow her adventures at @mylestotravel.